An electrically neutral penny, of mass m = 3.11 g, contains equal amounts of positive and negative charge. (a) Assuming that the penny is made entirely of copper, what is the magnitude q of the total positive (or negative) charge in the coin? (b) Suppose that the positive charge and the negative charge in a penny could be concentrated into two separate bundles, 100 m apart. What attractive forces would act on each bundle? (a) A neutral atom has a negative charge of magnitude Ze associated with its electrons and a positive charge of the same magnitude associated with the protons in its nucleus, where Z is the atomic number of the element in question. For copper, Z = 29, which means that an atom of copper has 29 protons and, when neutral, 29 electrons. From the above observation we conclude that, the attractive force act on each bundle would be 1.69×1016 N.
Find the field outside a charged solid sphere of radius R and total charge q. 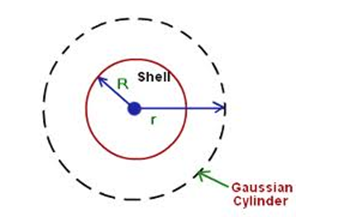 Draw a spherical surface of radius r>R in the below figure. 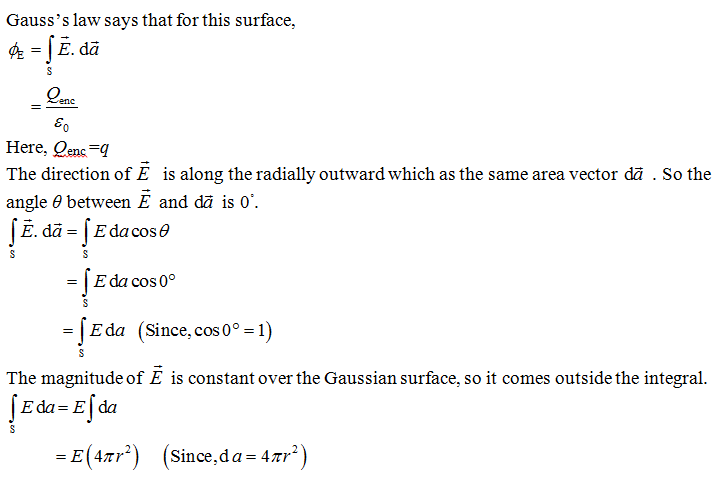 This is called Gaussian surface. From the above observation we conclude that, the field outside the sphere is exactly the same as it would have been if all the charge had been concentrated at the center. A neutral water molecule (H2O) in its vapor state has an electric dipole moment of 6.2×10-30C.m. (a) How far apart are the molecule’s centers of positive and negative charge? (b) If the molecule is placed in an electric field 1.5×104 N/C, what maximum torque can the field exert on it? (c) How much work must an external agent do to turn this molecule end for end in this field, starting from its fully aligned position, for which θ = 0? This distance is not only small, but it is actually smaller than the radius of a hydrogen atom. From the above observation we conclude that, the work done by the external agent would be 1.9×10-25 J. The electrostatic repulsive force between two positively charged ions carrying equal charges is given by 3.7×10 N. These charges are separated by a distance of 5×10-10 m. Calculate the number of electrons missing from each ion? From the above observation we conclude that, the number of electrons missing from each ion will be 2.